34 • SPONSORED CONTENT • OCTOBER 2018 When Andrew Dana and Chris Brady created Wash- ington, D.C.'s Timber Pizza in May 2014, its Neapolitan-type pizza was solely available at local farmers markets. After partnering with Chef Dani Doreira, the team opened its first brick-and-mortar location in Petworth, D.C. in June 2016. Since then, Timber Pizza has received many accolades, including Bon Appetit's Best Pizzeria 2017 and the Washington Post's Best Pizza 2016. Dana and Brady's newest venture is a Jewish-inspired deli in the city's Park View neighborhood named Call Your Mother Deli. It specializes in a hybrid, wood-fired bagel that's a cross between Montreal style with the sweet flavor and the boiled and baked New York style with a chewy consistency. "We have been running Timber Pizza for three years and are ready for the next challenge," says Dana. "We love bagels, so wood-fired bagels was the way to go. No one in D.C. has a restaurant like it." Developed after extensive testing and a two-day bagel workshop held at Smoke Signals Bakery in North Carolina, these form the base of Call Your Mother's sandwiches, which include egg, smoked whitefish and smoked salmon, many topped with homemade cream cheese. This menu also provides a unique twist on Jewish deli favorites, such as latkes fries and seared matzo ball soup. Timber Pizza has benefitted from custom ovens manufac- tured by Marra Forni's Metal Fabrication Department, which is capable of accommodating any size or shape an operator de- sires while retaining the same heat consumption and retention of a traditional oven. Although the predominant use for these units is for pizza, they are capable of a wide range of cooking tasks, from steak to fish to unique bagel styles. With its Metal Fabrication Department, Marra Forni controls the entire process of manufacturing. Operators benefit from faster lead time, controlled quality, new equip- ment and more personalization and customization. The advantages are they can build custom shapes and sizes without compromising the quality or turnaround time." "We had a different oven prior, and the change was like night and day," says Dana. 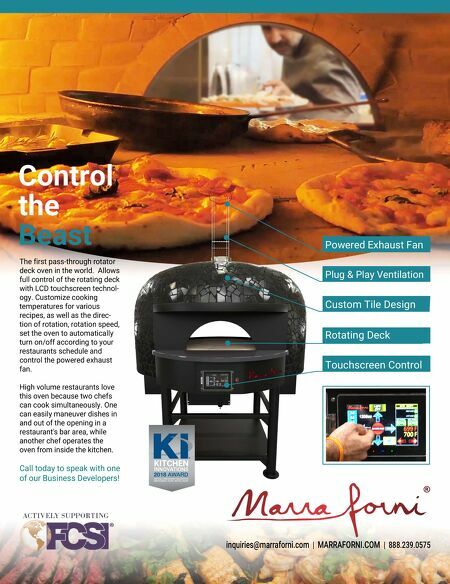 "Marra Forni's custom built oven is easier to use, and the product quality is great. For a pizza oven, it holds the temperature well." In addition to pizza, the oven is used for making empana- das, baking bread and roasting meat and vegetables. On the weekends, pastries and biscuits are prepared in these units. Timber Pizza also includes a mobile operation with two Marra Forni ovens. 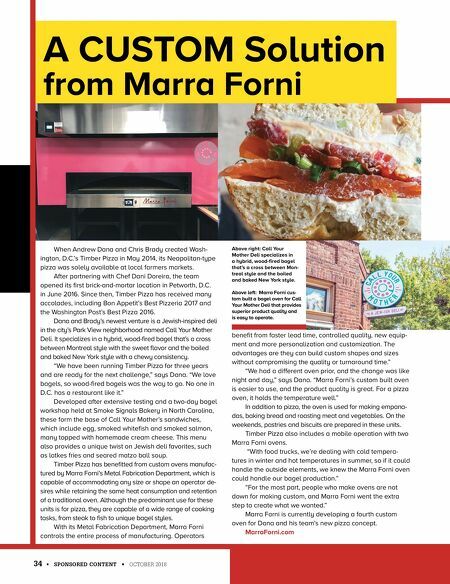 "With food trucks, we're dealing with cold tempera- tures in winter and hot temperatures in summer, so if it could handle the outside elements, we knew the Marra Forni oven could handle our bagel production." "For the most part, people who make ovens are not down for making custom, and Marra Forni went the extra step to create what we wanted." Marra Forni is currently developing a fourth custom oven for Dana and his team's new pizza concept. MarraForni.com A CUSTOM Solution from Marra Forni Above right: Call Your Mother Deli specializes in a hybrid, wood-fired bagel that's a cross between Mon- treal style and the boiled and baked New York style. Above left: Marra Forni cus- tom built a bagel oven for Call Your Mother Deli that provides superior product quality and is easy to operate.